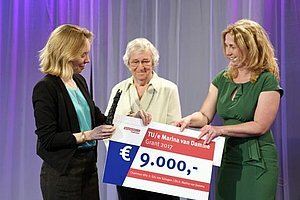 The objective of the Marina van Damme Fund is to support talented female alumni who have graduated or obtained a doctorate from the TU/e in taking the next step or making the next turn in their careers. The €9000 grant is intended to add depth or breadth to the recipient’s knowledge or to support an international orientation in the form of a study program, internship, or project. 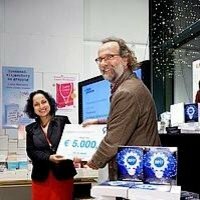 In 2015, the happy winner was Lisanne van Oppen, an alumna of the TU/e program in Biomedical Engineering, who is currently a PhD student affiliated with Radboud University Medical Center in Nijmegen, where she is conducting research on targeted drug delivery. Van Oppen will use the €9000 grant to spend three months in Barcelona for a detailed introduction to new imaging techniques, including super-resolution microscopy. The Marina van Damme grant is awarded to the female engineer submitting the best proposal. The €9000 grant is intended to help the winner take an important step in her career. The sum must be spent on training that will make it possible to make a ground-breaking career step. Two €1000 incentive prizes are awarded as well. Van Damme has reserved the amount of €253,000 for the TU/e to ensure that the prize can be awarded for the coming 23 years. With the signature of the agreement, the grant became the largest legacy ever received by the TU/e. With their remarkable projects, the student teams are proving that things can be done more quickly, more efficiently, safer, and – most importantly – more sustainably. The students are pooling their knowledge and creativity in order to realize their adventurous dreams. “The special thing about these student teams is that they incite a great deal of energy on the part of young people. Those teams have an incredible amount of potential,” notes Prof. Maarten Steinbuch, Professor of Control Systems Technology at the TU/e.